Continuous subcutaneous insulin infusion (CSII), using a portable infusion pump, was first shown to be effective in the 1970s4 and is now widely used in paediatric practice. A continuous but varying amount of rapid-acting insulin is delivered subcutaneously, mirroring physiological insulin release more closely than MDI. Therefore, its aims are to further reduce hyperglycaemia and subsequent complications, decrease episodes and associated fear of hypoglycaemia, and improve quality of life for children and their families. Despite worldwide variation, international guidelines and registry data support CSII use,5 and many families are keen to have a pump. A 2012 UK audit identified CSII use in 19% of children and young people,6 and this is likely to have increased. In the USA over 60% of children aged 2–12 years old with T1D use CSII.7 Therefore, increasing numbers of children and young people using CSII will present to hospital with a range of problems, related or unrelated to T1D. CSII is made up of an insulin reservoir (typically storing 176–300 units of insulin), an infusion set with a small cannula—inserted subcutaneously and made of plastic or metal, a battery-operated motor and an electromechanical pump with a computerised control. Multiple sites (abdomen, outer thigh, hips, buttocks and top of the arms) can be used to insert the infusion set cannula and sites should be rotated. Continuous rapid-acting insulin is delivered subcutaneously—the ‘basal’ insulin—which can be set to any amount (as little as 0.025 units per hour for most pumps; 0.01 units per hour with the Roche Insight pump), and so ideal for any-sized child, including infants. Basal insulin is varied throughout the day and night, reflecting physiological variation in fasting insulin requirements. Additionally, ‘bolus’ insulin is given before meals, and as ‘correction doses’ in hyperglycaemia, via the computerised handset device. Most families use bolus calculators incorporated into the CSII, entering carbohydrate intake, along with their current blood glucose (BG) reading, to calculate insulin doses. The handset display allows recall of information, such as basal insulin rates throughout the day and total daily doses of insulin. Further terminology is explained in box 2. BG, blood glucose; NICE, National Institute for Health and Care Excellence. Is using CSII better than other insulin regimens? So when should insulin pumps be used? children under 12 years when MDI is deemed ‘impractical’ or ‘inappropriate’. There are many CSII systems available, made by different companies, including Animas (Johnson & Johnson), Cellnovo, Medtronic, Omnipod, Roche, Sooil, Ypsomed. Children/young people and their families may have a choice, and decisions might be influenced by the design of the computerised handset device, tubing, cannula types, colour and whether the pump is waterproof. The majority of pumps use a subcutaneous cannula; however, an alternative is the ‘patch pump’, which attaches directly to the skin, and therefore needs no tubing. Glucometer devices may be integrated into or be separate from the CSII. The insulin reservoir is either loaded with prefilled insulin cartridges or the child/carer needs to fill the insulin cartridge manually, as per the manufacturer’s instructions. There are variations in algorithms to calculate insulin boluses, set by the manufacturers, for example in the prediction models used for glucose rise after meals, whether the pump corrects to a high/low BG target or to mid-range, and how the algorithm interprets ‘insulin on board’ if multiple insulin boluses are given (box 2). What can go wrong with an insulin pump? Children/young people using CSII may present acutely with hyperglycaemia or hypoglycaemia, or with an unrelated medical or surgical condition. In all scenarios some knowledge about the pump, insulin requirements and BG values is needed. What is the current BG? What has the recent trend of BG values been? Have they had any hypos? What treatment was given? How much insulin have they given today? Has there been any insulin:carbohydrate mismatch, for example, any carbohydrate eaten without giving insulin? When did they last give an insulin bolus? Have correction boluses been given? What has their oral intake been like? What is the ketone level and what has the trend been? Blood ketones must always be checked if unwell (regardless of the BG) and with hyperglycaemia (BG >14 mmol). Any recent travel, altering the time on the insulin pump to local time, which has not been changed back. Recent exercise—this is a complex area, and depending on the type and intensity of different sports can cause either hypoglycaemia or hyperglycaemia. Effects can also be immediate or much later, even affecting BG levels the subsequent day. Children and their families will be given ‘sick day rules’ advice to follow and should contact the diabetes on-call team when unsure. It is important to remember that insulin should never be stopped even when a child is unwell, but may need adjusting. If a child presents to hospital, specialist advice should still be sought, including out-of-hours. An overview of management is discussed below and in figure 1 and figure 2. 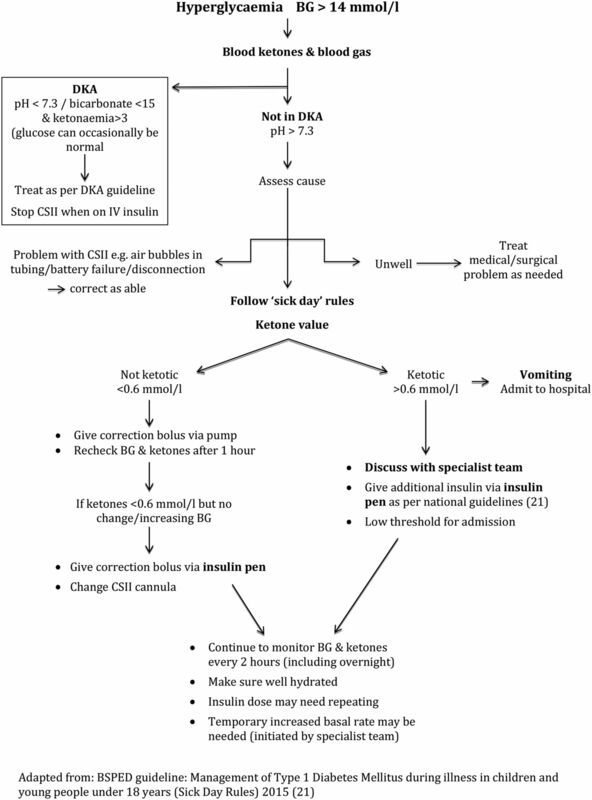 Management of hyperglycaemia. BG, blood glucose; CSII, continuous subcutaneous insulin infusion; DKA, diabetic ketoacidosis. The management of DKA must be the same as with any child, following national guidelines.19 Since CSII delivers rapid-acting insulin alone, with no long-acting insulin, children are potentially at greater risk of DKA, than those on MDI, if the CSII stops working or when they are disconnected from the pump. The risk of DKA is high after 4–6 hours, but blood ketones may start rising 1–2 hours after disconnection. CSII should be stopped when intravenous insulin is started. When subcutaneous insulin is restarted, CSII should be started at least an hour before stopping intravenous insulin. The insulin cartridge and infusion set should be changed, with a new cannula inserted. Extra insulin can be given as bolus doses and/or by increasing the CSII basal insulin rate. An initial correction bolus can be given via the pump, using the bolus calculator (which uses the insulin sensitivity factor (ISF)). However, with no improvement or high/rising ketone levels, a bolus of rapid-acting insulin should be given with an insulin ‘pen’ and the CSII infusion set changed. All children/young people using CSII will have a rapid-acting insulin ‘pen’ for this reason. If families are unsure of the ISF, a correction dose can be estimated from the TDD, found on the CSII monitor (box 3). With high/rising ketone levels it is appropriate to give 10%–20% of TDD, depending on the ketone value.21 It is important to remember that insulin boluses can be given 2 hourly but not more frequently to avoid ‘insulin stacking’ (where previous insulin is still active). Additionally an increased temporary basal rate may need to be set (125%–200%). All increases in insulin should be discussed with the diabetes team. For example, if the TDD is 20, the ISF is 100/20=5. So, 1 unit of insulin will reduce blood glucose by 5 mmol/L. For example, if the TDD is 20, the ratio is 500/20=25. That is, 1 unit insulin should be given with 25 g carbohydrate. Or ‘300’ rule is often used instead for young children. For any unwell child with T1D, frequent BG and ketone monitoring (hourly–2 hourly) should continue, and fluids encouraged to avoid dehydration and increase renal excretion of ketone bodies, using sugar-free fluids in hyperglycaemia. If there is no improvement, ketone levels are rising or the child is vomiting, they will need admission. In hyperglycaemia, checks should always be made for battery failure, disconnection or tubing occlusion. If air is seen in the tubing, it should be disconnected and the CSII ‘prime’ cycle used to prime the tubing with insulin, removing air bubbles. All manufacturing companies have a telephone support service for families (normally 24 hours) and can troubleshoot other problems. Hypoglycaemia must be treated immediately with fast-acting carbohydrate, or with intravenous dextrose if severe. All families are provided with an emergency kit containing glucose, and intramuscular glucagon to use if the child is not able to take oral glucose, while waiting for an ambulance. Hypoglycaemia is most commonly a result of intercurrent illness, particularly gastroenteritis, or insulin:carbohydrate mismatch (figure 2). It is often difficult to manage gastroenteritis in a child/young person with T1D, especially if their oral intake is reduced. It is important not to stop the insulin, and again families will follow the ‘sick day rules’. (Sometimes changes are made to the temporary basal rate, by the diabetic team.) However, additional glucose intake is needed, and sips of sugar-containing fluids should be given frequently. Blood ketone levels must be checked regularly and ‘starvation’ ketones may be raised with vomiting and reduced oral intake, needing increased fluid in addition to glucose. If this is not possible or the child is vomiting, admission and intravenous dextrose will be needed. CSII use has changed diabetes management, improving glucose control and quality of life for children/young people and their families. However, it brings added complexity to acute paediatric care, requiring specialist input. Sick day rules and national guidelines should be followed, and insulin should not be stopped, even in intercurrent illness.
. Beneficial effects of intensive therapy of diabetes during adolescence: outcomes after the conclusion of the Diabetes Control and Complications Trial (DCCT). J Pediatr 2001;139:804–12.
. Insulin pumps and continuous glucose monitoring made easy. The Netherland: Elsevier, 2016.
. Methods for Insulin Delivery and Glucose Monitoring: Comparative Effectiveness. Rockville: Agency for Healthcare Research and Quality, 2012. National Institute for Health and Care Excellence. Continuous subcutaneous insulin infusion for the treatment of diabetes mellitus. Technology appraisal guidance [TA151]. 2008 https://www.nice.org.uk/guidance/ta151. International Diabetes Federation. Global IDF/ISPAD Guideline for Diabetes in Childhood and Adolescence. Germany: ISPAD Executive Office, 2011. http://c.ymcdn.com/sites/ispad.site-ym.com/resource/resmgr/Docs/idf-ispad_guidelines_2011_0.pdf.
. BSPED Recommended Guideline for the Management of Children and Young People under the age of 18 years with Diabetic Ketoacidosis, 2015. http://www.bsped.org.uk/clinical/doCS/DKAguideline.pdf. National Institute for Health and Care Excellence. Diabetes (type 1 and type 2) in children and young people: diagnosis and management (NG18), 2015. https://www.nice.org.uk/guidance/ng18.
. Management of Type 1 Diabetes Mellitus during illness in children and young people under 18 years (Sick Day Rules), 2015. http://www.bsped.org.uk/clinical/docs/Sick_day_guideline_Main.pdf.